Pascoe and Pepper’s pamphlet does not say much about the basic rule for the succession of new States to the territory of old colonial powers.1 This rule, also known as the principle of uti possidetis iuris, is widely accepted in international practice and jurisprudence, and those British authors seem to accept the rule of succession to Spain’s rights. Still, this rule is questioned by British bloggers who nevertheless scrupulously follow Pascoe and Pepper’s pamphlet. This chapter will prove the pertinence of the rule, its opposability to Great Britain, and the latter’s acceptance of it, as well as Argentina’s succession to Spain’s rights over the Falklands/Malvinas. Uti possidetis iuris of 1810 is a rule relating to the succession of States to territory followed by the States of Spanish South America. The relevant date for South America does not match the dates of proclamation of independence in the various South American countries for the reason that, from 1810 onwards, these ceased to recognise the colonial authorities – although formal proclamations of independence would only come later. The new states inherited the territory belonging to the Spanish Crown, on the basis of the administrative divisions existing in 1810. The same analysis perfectly fits the case of the Falklands/Malvinas, with the difference that Spanish title to the islands was not only based on discovery, but also the effective occupation of the archipelago until 1811 and recognition by other powers. The attitude of His Britannic Majesty’s government shows that uti possidetis was opposable to Britain, since the Falkland/Malvinas Islands were subject to Spanish sovereignty. European powers did not react to the assertion that no terrae nullius existed in Latin America.4 The analysis of international practice and jurisprudence in cases of territorial disputes between a Latin American State and an extra-continental power leads to the conclusion that uti possidetis was applicable to the extra-continental States. Acts of sovereignty are therefore considered to confirm a pre-existing title of succession. An identical analysis can be made in regard to Argentina’s takeover of the Falklands/Malvinas in 1820. This text unequivocally recognizes that Latin American States succeed to Spain and Portugal within the borders existing during the colonial period. Subsequent practice supports Britain’s point of view about Latin America’s legal situation. Even if uti possidetis is set aside, being considered the applicable customary rule unless otherwise agreed by the parties involved, the same conclusion can be reached, in a different manner. On example is the analysis of the consequences flowing from the status of belligerent and the fact that the South American provinces eventually separated from the Spanish Empire. Due to the state of rebellion in the South American provinces, the international legal situation in Spanish America was comparable to that of a civil war. The rebels could not invoke a right of independence from Spain: they had to gain independence. Third States had to adopt a policy of neutrality –which they did. This means that they could not take advantage of the situation to take possession of the territories of the rebel provinces.8 The existence of a civil war or rebellion did not turn the territories of the States involved into vast terrae nullius, requiring occupation by one side or the other to avoid foreign occupation. The fact that British de iure recognition of Argentina occurred after 1820 does not change this conclusion in any way. In 1818, Great Britain recognized the South American provinces as belligerents, as is apparent from George Canning’s note. This means that whatever the legal approach followed, whether the uti possidetis iuris of 1810 or the rules relating to civil war and secession, the territory in question does not become res nullius. In regard to the Falklands/Malvinas, if the uti possidetis iuris of 1810 is discarded in favour of the theory requiring effective possession in case of secession, the conclusion would be that the islands were Spanish until 1820, when the government of the Provincias Unidas (United Provinces) took possession of them. In short, the principle according to which a new State succeeds to the territorial sovereignty of its old metropolis at the moment of independence, in the framework of boundaries existing at that time, is indisputable. Unable to avoid the application of the principle of uti possidetis iuris or succession of States to the Falklands/Malvinas, Pascoe and Pepper make an argument that is not advanced by any State. According to the authors, the fact that the Viceroyalty of the Rio de la Plata included the territories of the present-day republics of Uruguay, Paraguay, Bolivia, and – according to them – portions of Chile and Peru creates a problem over “the identity of the heir”.16 This is an untenable argument. During colonial times, the Falkland/Malvinas Islands were under the direct authority of the Captaincy- General of Buenos Aires17 and subsequently, upon its creation by virtue of the Royal Charter dated August 1st, 1776, under the authority of the Viceroyalty of the Rio de la Plata,.18 The seat of the Viceroy was Buenos Aires. The other existing administrative divisions, (audiencias, governorates, intendencias) had a limited autonomy and depended on the authority of the Viceroy. According to the Royal Ordnance of Intendentes dated 1782, the Superintendence of Buenos Aires comprised the district of the Buenos Aires Bishopric, which included the coastal cities and their respective jurisdictions, the Governorate of Montevideo, the Governorate of Malvinas, the eastern area of Patagonia, Tierra del Fuego and other territories which formed part of the old Governorate of the Rio de la Plata, with the exception of the thirteen missions founded along the Parana river, which had been incorporated in the diocese of Asunción.19 Consequently, none of the administrative divisions that subsequently became independent States (Paraguay in 1811, Bolivia and Uruguay in 1825) had jurisdiction over the Falklands/Malvinas in 1810. Furthermore, their independence is an instance of separation from the United Provinces of the Río de la Plata. The prior section has shown Spain’s unquestionable sovereignty and possession of the Falkland/Malvinas Islands at the time of the beginning of the Argentine process of independence: May 25th, 1810. International law recognises the succession of new States to the territorial sovereignty existing at the moment of independence. Based on the above, the State which succeeded to Spain’s sovereignty over the Falklands/Malvinas is the State known by the name of the United Provinces of the Río de la Plata, and later as the Argentine Republic. 2 Frontier Dispute (Burkina Faso/Republic of Mali), judgment, I.C.J. Reports 1986, p. 565, par. 20 (see also ibid., p. 566, par. 23). 3 Land, Island and Maritime Frontier Dispute (El Salvador/Honduras: Nicaragua intervening) I.C.J. Reports 1992, p. 416, par. 333. Ist may also be mentioned that in the 19th Century Great Britain wanted to take El Tigre Island, one of the islands in the Fonseca Gulf, in a new and flagrant violation of international law. 4 See, for example: Decencière-Ferrandière, André, “Essai historique et critique sur l’occupation comme mode d’acquérir les territories en droit international”, Revue de droit international et de législation comparée, 1937, vol. 64, pp. 388-390. According to this author, practice at the time proves the exclusion of effective occupation as a way to obtain sovereignty in Latin America, both for third states and among Latin American nations. 5 Spanish Text in Gros Espiell, Héctor, España y la solución pacífica de los conflictos limítrofes en Hispano- América, Madrid, Civitas, 1984, pp. 128-129 and the comments of the author quoted at pages 47-52. 6 Marston, Geoffrey, “The Anglo-Brazilian Dispute over the Island of Trindade”, British Year Book of International Law, Oxford, 1983, Vol. LIV, p. 238. 8 On December 7th, 1819, in his message to the Congress of the United States, President Monroe asserted: “In the civil war existing between Spain and the Spanish provinces in this hemisphere the greatest care has been taken to enforce the laws intended to preserve an impartial neutrality” ”(Moore, John Bassett, A Digest of International Law, Washington, Government Printing Office, 1906, Vol. I, p. 83). In his message delivered on March 8th, 1822, the same president would say: “As soon as the [revolutionary] movement assumed such a steady and consistent form as to make the success of the provinces probable, the rights to which they were entitled by the law of nations, as equal parties to a civil war, were extended to them” (Ibid., p. 174). 9 Smith, Herbert Arthur, Great Britain and the Law of Nations, London, King & Son, 1932, Vol. I, p. 280. 10 See Article 10 of the Articles on State responsibility, adopted by the International Law Commission, (Annex to Resolution 56/83 of the General Assembly of the United Nations). 11 Colombia v. Venezuela (1922), Reports of International Arbitral Awards, vol. 1, p. 228. 12 Ferrer Vieyra, E., “An annotated legal...”,op. cit..., p. 130. 13 Gaston de Bernhardt’s Memorandum of December 7th, 1910 (FO 881/9755), pp. 11-12. 14 Minutes by Ronald H. Campbell, 18th July 1811, National Archives, FO 371/1258, pp. 221-222 (Spanish text in Ferrer Vieyra, E., Segunda Cronología..., op. cit..., p. 413). 15 Chagos Marine Protected Area Arbitration (Mauritius v. United Kingdom), Counter-Memorial of the United Kingdom, July 15, 2013, p. 189, par. 7,8. 16 Pascoe, Graham and Pepper, Peter, op. cit., p. 4. 17 AGN Sala IX 8-10-3. 18 AGN Sala IX 8-10-4. 19 San Martino de Dromi, María Laura, Intendencias y provincias en la historia argentina, Buenos Aires, Ed. Ciencias de la Administración, 1992, pp. 44-45. Cited source: “Real Ordenanza para el Establecimiento e Instrucción de Intendentes de Exército y provincias en el Virreinato de Buenos Aires. Año de 1782. 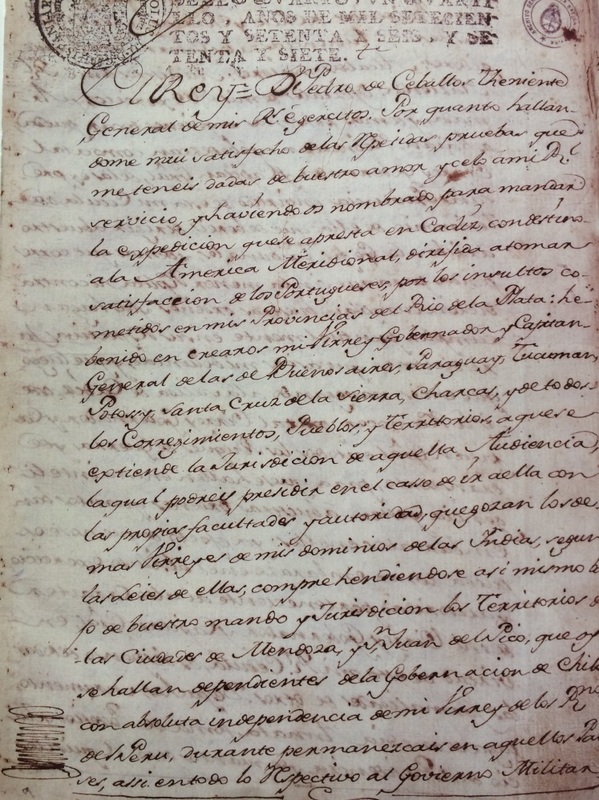 De orden de su Magestad”, Madrid, Imprenta Real, 1782, in AGI, L.A., s. XVIII (sig. ant. H-18). 20 Gros Espiell, Héctor, “La soberanía en Malvinas. Un antecedente de interés”, Revista Internacional y Diplomática, México, 383, October 1982, p. 33; reproduced in J. Ramiro Podetti (ed. ), Visiones uruguayas sobre Malvinas, Montevideo, Fin de Siglo, 2013, p. 135. 21 AGS, Leg. 6915, in Quesada, Vicente, Recuerdos de mi vida diplomática, misión en Estados Unidos (1885- 1892), Buenos Aires, Lib. Menéndez, 1904, pp. 200-202.